aFrom the Division of Neuroradiology (A.J.d.R., R.H.N., A.C.M.M., L.L.F.d.A. ), Santa Casa de São Paulo School of Medical Sciences, São Paulo, BrazildDivision of Neuroradiology (L.L.F.d.A. ), Med Imagem, Hospital da Beneficência Portuguesa de São Paulo, São Paulo, Brazil. SUMMARY: Limbic encephalitis is far more common than previously thought. It is not always associated with cancer, and it is potentially treatable. Autoantibodies against various neuronal cell antigens may arise independently or in association with cancer and cause autoimmune damage to the limbic system. Neuroimaging plays a key role in the management of patients with suspected limbic encephalitis by supporting diagnosis and excluding differential possibilities. 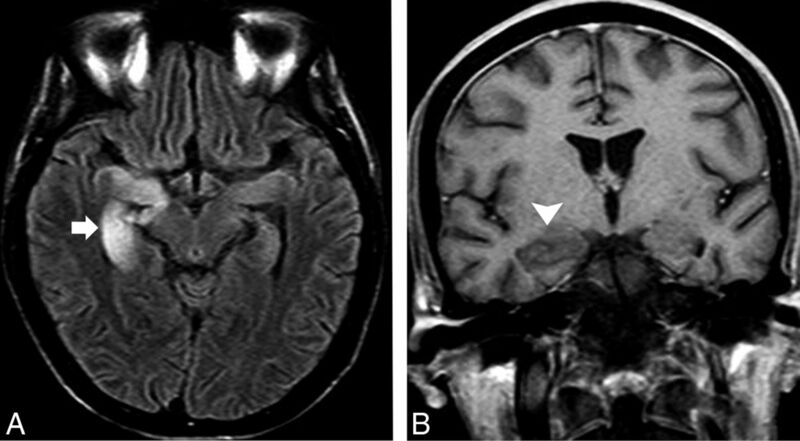 This article describes the main types of autoimmune limbic encephalitis and its mimic disorders, and emphasizes their major imaging features. MR imaging plays a key role in the management of patients with suspected LE and is used as part of the LE diagnostic criteria to rule out differential diagnoses. Certain imaging and clinical peculiarities may narrow the list of possible diagnoses; however, a complete list of differential diagnoses remains beyond the scope of this article. Our current aim was to describe the most commonly reported MR features of LE and its mimic disorders. A 62-year-old man with subacute cognitive impairment and seizures. A, An enlarged and hyperintense right hippocampus in a coronal FLAIR image (arrowhead). Additional right amygdala involvement was observed, but no abnormal enhancement was documented after intravenous gadolinium administration (not shown). B, Body CT after contrast administration shows a right hilar mass (arrow) with an enlarged lower paratracheal lymph node (asterisk). Endobronchial biopsy specimen revealed an small cell lung carcinoma, and the diagnosis was consistent with PLE. CV2/Collapsing Response Mediator Protein-5 Antibodies. A previously healthy 44-year-old woman presented with subacute psychiatric disturbance with no fever or seizures. A, Bilateral and asymmetric hyperintensity was observed on an axial FLAIR image in the enlarged amygdalae and hippocampi (asterisks), predominantly on the left side. B, A faint ill-defined enhancement of the left hippocampus was documented on an axial T1 postcontrast image (arrowheads). Autoimmune encephalitis was considered, and the presence of anti–N-methyl-D-aspartate receptor autoantibodies was confirmed. C and D, Imaging follow-up revealed signal abnormalities and atrophy on FLAIR that involved the hippocampus, amygdala, parahippocampal gyrus, and left insula (arrowheads), compatible with severe sequelae. Other PLEs with Autoantibodies against Extracellular Antigens. A 22-year-old man with Hodgkin lymphoma presented with acute onset of short-term memory loss and mental confusion. A, An evident hyperintensity and subtle enlargement of the right hippocampus and amygdala were noticed on an axial FLAIR image (arrow). B, No parenchymal enhancement was observed (arrowhead). In addition to the fact that CNS involvement is not expected in Hodgkin lymphoma, a lack of enhancement is not the expected imaging pattern. After the patient did not respond to antiviral treatment, PLE was considered. The findings fulfilled the criteria for Ophelia syndrome, which consists in an interval of <4 years between the onset of neuropsychiatric disturbance and the diagnosis of the Hodgkin lymphoma, exclusion of other cancer-related complications, and evidence of hippocampal abnormalities on MR imaging. A 38-year-old woman presented with personality and behavioral changes associated with progressive drug-resistant epilepsy. Memory testing revealed an anterograde episodic memory disorder, and electroencephalography showed TL epileptiform discharges. A, A selective hyperintensity in the hippocampi that extended to the amygdalae bilaterally was noticed on an axial FLAIR image, predominantly on the left side (arrow). B, Imaging follow-up revealed bilateral hippocampal sclerosis, which is shown in a coronal FLAIR image (arrowheads). Whole-body PET/CT and pelvic sonography were unremarkable (not shown). Autoimmune encephalitis was suggested, and a high titer of GAD65 antibodies was confirmed. A healthy 46-year-old woman presented with an acute onset of psychiatric disturbance and hyponatremia. A, Bilateral hyperintensity and mild enlargement were noticed on an axial FLAIR image in both hippocampi and amygdalae. B, No abnormal restricted diffusion was observed on DWI. The final diagnosis was anti-VGKC encephalitis. Restricted diffusion may occur in approximately 50% of patients at this phase and is usually restricted to the limbic system. The presence of faciobrachial dystonic or tonic seizures, hyponatremia, and unremarkable CSF in the setting of LE should raise concern that anti-LGI1 encephalitis is present. Abnormal MR signal intensity that involves the TL has a broad differential diagnosis that includes a range of unrelated disorders that are rarely reported, for example, Whipple disease,49 4-aminopyridine toxicity,50 and hypoglycemia.51 Neuroradiologists must recognize these disorders and their imaging features more often. It has been demonstrated that some types of viral encephalitis can trigger autoimmune LE,53,54 particularly anti-N-methyl-D-aspartate receptor encephalitis.55 This phenomenon occurs when prolonged or atypical neurologic symptoms recur after successful control of the viral infection. Some patients with negative viral results develop a syndrome described as relapsing post-HSE or choreoathetosis post-HSE. A few weeks after recovery from HSE, children present with abnormal movement and adults present with behavioral changes that are not associated with additional brain lesions on MR imaging or response to antiviral therapy. 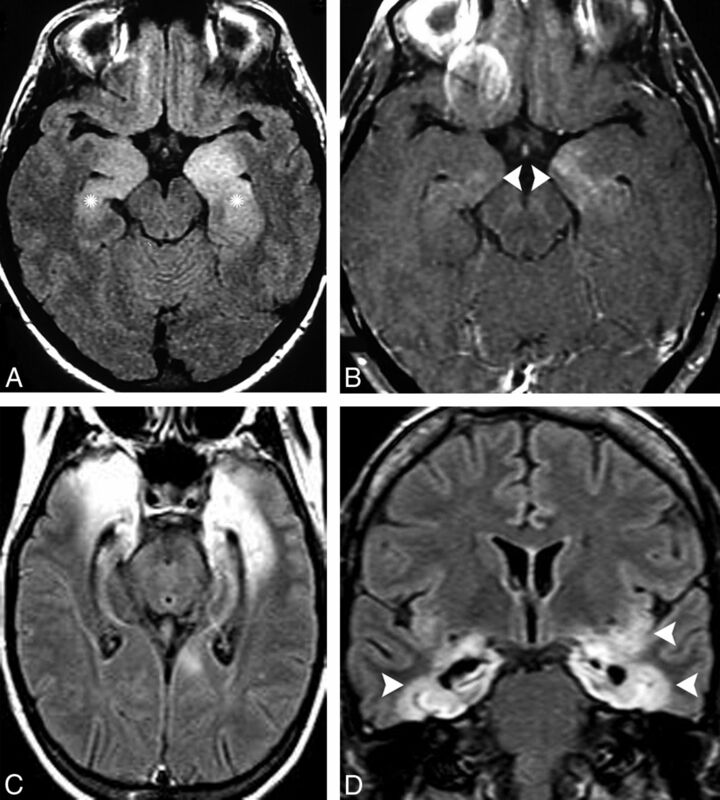 The incidence of neurosyphilis, caused by a spirochete (Treponema pallidum), has once again begun to increase in the era of acquired immunodeficiency syndrome.56 MR imaging shows a variety of usually nonspecific findings, including selective involvement of the TL that mimics HSE and LE.10,56 In older subjects with a long latency period of infection or in patients who are immunocompromised, T2/FLAIR hyperintensities in the mesial TL areas that may or may not be associated with either atrophic or gadolinium-enhanced areas increase the likelihood that neurosyphilis is present rather than other etiologies (Fig 6). A 47-year-old man with HSE. A, Bilateral symmetric cortical swelling and hyperintensity on axial FLAIR were observed in the anteromedial TLs (arrows) and also affected the insular cortex and rectus gyri (arrowhead). B, Restricted diffusion was documented in the same areas on DWI (asterisks). Bilateral and usually asymmetric involvement of the limbic system sparing the basal ganglia in the setting of acute LE should raise concerns for HSE. The presence of hemorrhagic foci and gyriform enhancement are also of diagnostic value in more-advanced disease. C, A similar pattern with bilateral asymmetrical involvement of the anteromedial TLs (arrows) on coronal FLAIR was observed in addition to the extensive white matter changes (arrowheads) in a 59-year-old man with progressive dementia who was later diagnosed with neurosyphilis. 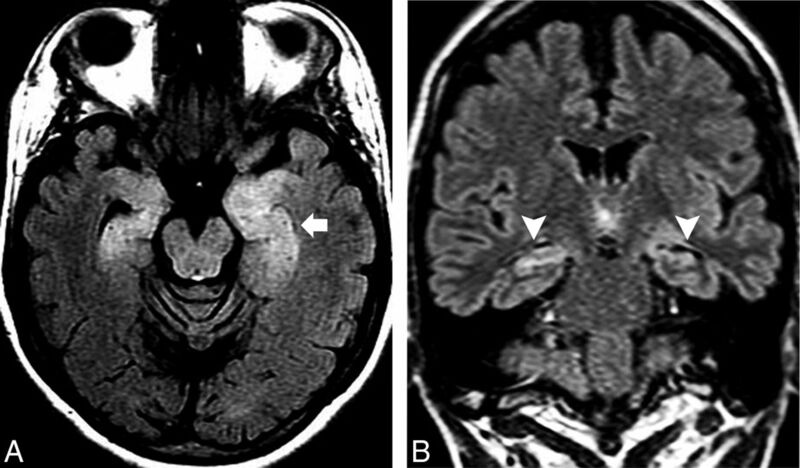 A previously healthy 67-year-old man presented with a transient isolated episode of partial complex seizures and dysphasia. A, A cortical abnormality that involved the lateral aspect of the left TL (asterisk) and a subtle hyperintensity on coronal T2 were noticed in the ipsilateral hippocampus. B, Restricted diffusion on DWI was visible in the same areas (arrowhead), and a diagnosis of postictal edema was considered. 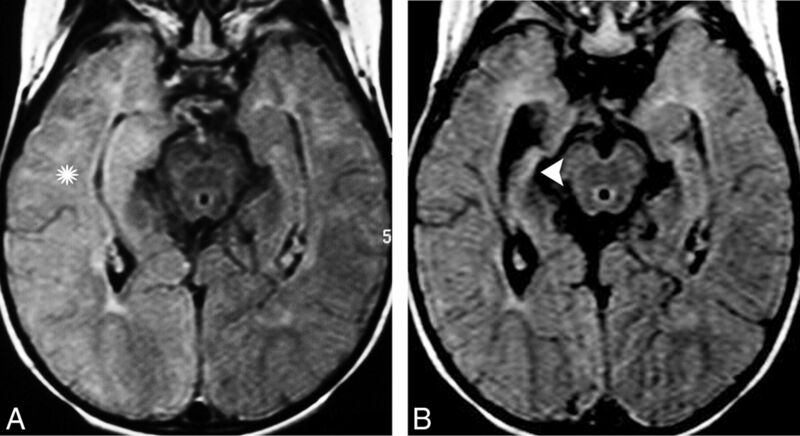 C, After 2 months and a worsening of the clinical manifestations, a necrotic mass in the left TL (arrow) was observed on a T1 postcontrast image. A diagnosis of glioblastoma was confirmed after surgery. High-grade gliomas can manifest early as ill-defined lesions that usually have restricted diffusion and involve the cortex with a lack of a mass effect. Follow-up imaging and advanced imaging techniques are crucial for making the diagnosis. 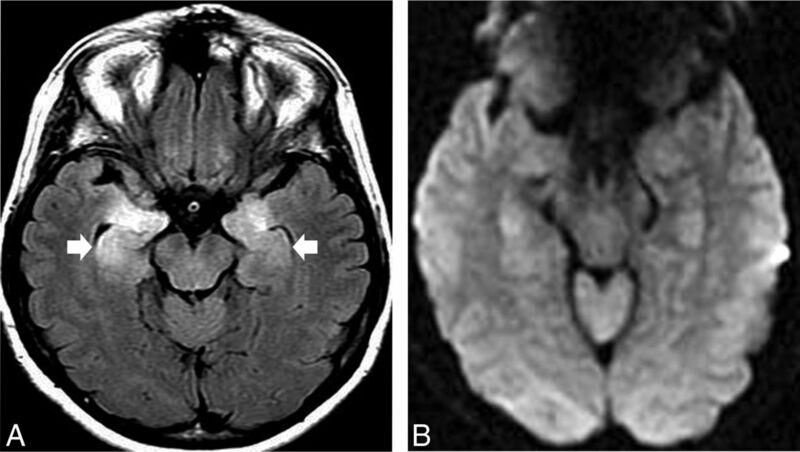 A 15-month-old child presented with a prolonged generalized tonic-clonic seizure episode. 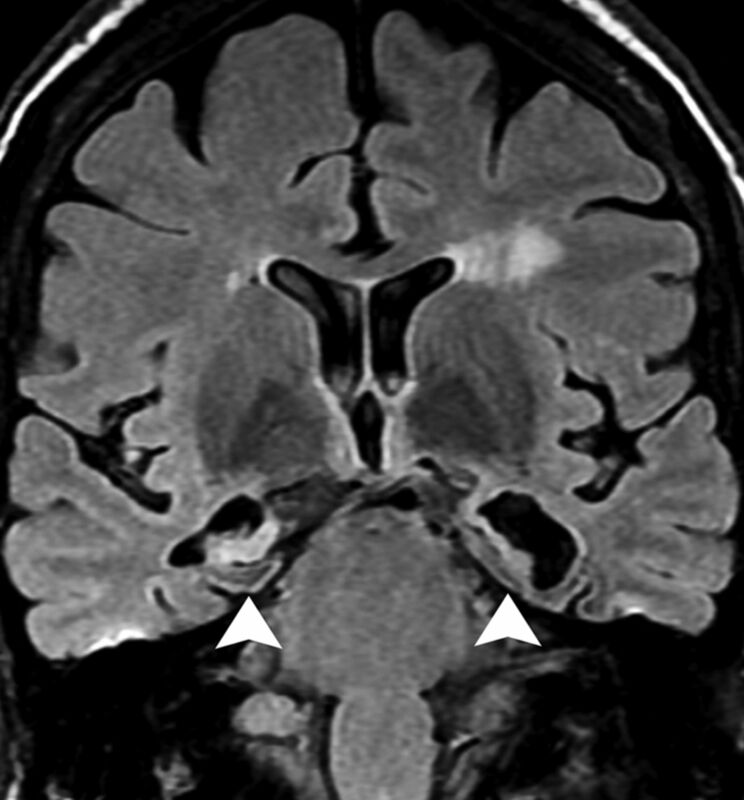 A, Extensive hyperintensity on an axial FLAIR image that involves the cortex and the white matter of the right TL (asterisk) indicated postictal edema. B, Comparative FLAIR imaging results on follow-up after 6 months are consistent with right mesial temporal sclerosis (arrowhead) in this patient who developed chronic epilepsy. A 45-year-old woman presented with strokelike episodes associated with fluctuating and progressive cognitive impairment. Severe atrophy and bilateral hyperintensity in the hippocampi (arrowheads) along with mild cortical atrophy and scattered white matter changes were observed on a coronal FLAIR image. Although the patient had euthyroid status, she presented with high titers of serum antithyroperoxidase (490 U/mL; reference value, <60 U/mL). After excluding other causes, the diagnosis of steroid-responsive encephalopathy associated with autoimmune thyroiditis was considered. A rare cause of LE is relapsing polychondritis, in which clinicoradiologic involvement of the limbic system might be more common than was previously thought.71,72 This condition is a disorder of unknown etiology that manifests as episodic and progressive inflammation of the cartilaginous structures of the body, as is suggested by the detection of autoantibodies against type II collagen restricted to the cartilage in the sera of 30%–50% of affected patients.73 MR imaging findings are coincident with LE; however, peculiar cartilage involvement may help identify this entity. 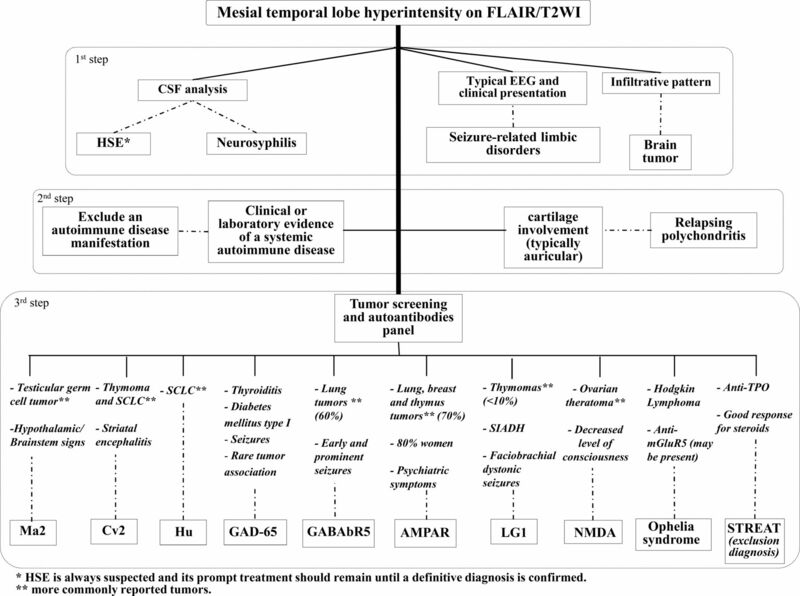 An algorithm that describes an approach to the diagnosis of limbic disorders by using clinical and neuroimaging features is presented in Fig 10. Proposed approach to the diagnosis of LE and its mimic disorders. SCLC indicates small cell lung carcinoma; SIADA, syndrome of inappropriate antidiuretic hormone; TPO, thyroperoxidase; NMDA, N-methyl-D-aspartate; STREAT, steroid-responsive encephalopathy associated with autoimmune thyroiditis; AMPAR, α-amino-3-hydroxy-5-methyl-4-isoxazolepropionic acid receptor. LE and the mimic disorders presented in this review have always existed. However, they have just begun to be clearly distinguished over the past decade. Their association with autoantibodies influences their prognosis and results in recognizable imaging patterns that vary according to the position of the causal antigens (intra- or extracellular) and the concurrence of cancer. Mimic disorders may represent a complication of an underlying malignancy or may occur independently. MR imaging is the best technique for recognizing limbic disorders and is useful for differentiating among them and for improving their investigation.